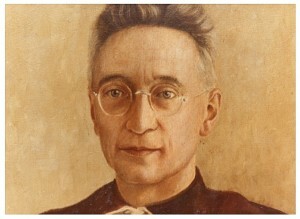 The Church’s liturgical calendar has a rather interesting friar, priest philosopher and martyr who is honored today: Titus Brandsma, O.Carm., the Dutch Carmelite friar opposed to Nazi ideology and who actively worked against it at the time of the Second World War; his last days were spent at the infamous Dachau concentration camp. Brandsma died on 26 July 1942, from a lethal injection administered by a German nurse of the SS, as an experiment. He was beatified as a martyr of the faith in November 1985 by Saint John Paul II. His feast day is observed within the Carmelite Order on 27 July. The Blessed entered the novitiate of the Carmelite friars in Boxmeer, Netherlands, on 17 September 1898, where he took the religious name Titus (to honor his father) by which he is now known, and professed his first vows in October 1899. Ordained priest in 1905, Brandsma was a scholar of Carmelite mysticism and was awarded a doctorate of philosophy at Rome in 1909. Beginning in 1916 Brandsma’s scholarly work was to translate the works of Saint Teresa of Ávila into Dutch. One of the founders of the Catholic University of Nijmegen (now Radboud University), Father Titus Brandsma was a professor of philosophy and the history of mysticism at the school in 1923; he later served as Rector Magnificus. As a teacher he had the reputation of being accessible. In 1935, Brandsma lectured on Carmelite spirituality in the US. Blessed Brandsma’s studies on mysticism, particularly that of the Carmelite style, was the basis for the establishment in 1968 as the Titus Brandsma Institute in Nijmegen. If you are interested you can search for his biography The Man behind the Myth.